Artist Yu Lien Yu creates unique art that expresses the heart and soul of the animal. Whether a horse or a beloved pet, Yu Lien has a special ability to capture the spirit of the subject. Yu Lien has a special perspective which allows her to capture unique aspects of animal life and transform those images into art. Yu Lien created this 24" X 30" canvas painting of "King Arthur," a Fresian stallion. Prices start at $65 and up. Yu Lien has hand-crafted boxes made from exotic woods produced by a local craftsman. Yu Lien can paint your favorite animal on a keepsake box. They make great gifts. Many varieties and sizes of boxes are available. Prices start at $300 and up. "JT" is a spirited Arabian gelding. Yu Lien spent many hours observing and interacting with the horse before determining the final pose she created. 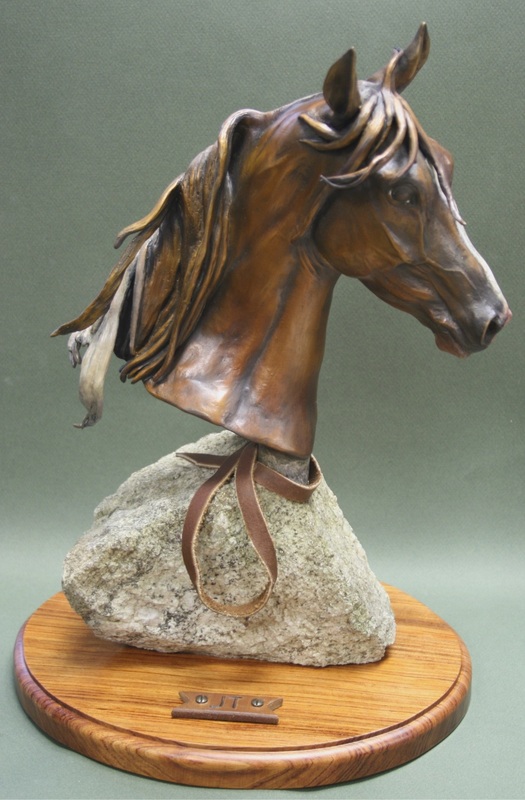 This unique piece is owned by a private collector who wished to have their horse immortalized in bronze. The piece measures approx. 14" in height and contains exquisite textures of bronze, stone, wood, brass, and leather. © 2014 Flying Stallion. All rights reserved.